The weather turned briefly warm over the past couple of days. Just as patches of grass emerged through the snow and the frozen patches turned to puddles, our thoughts turned to planting. February seems to do this to us. It’s still too cold to plant, of course, and it’s even a bit early to start seeds indoors, but we can think and we can dream and we can order. 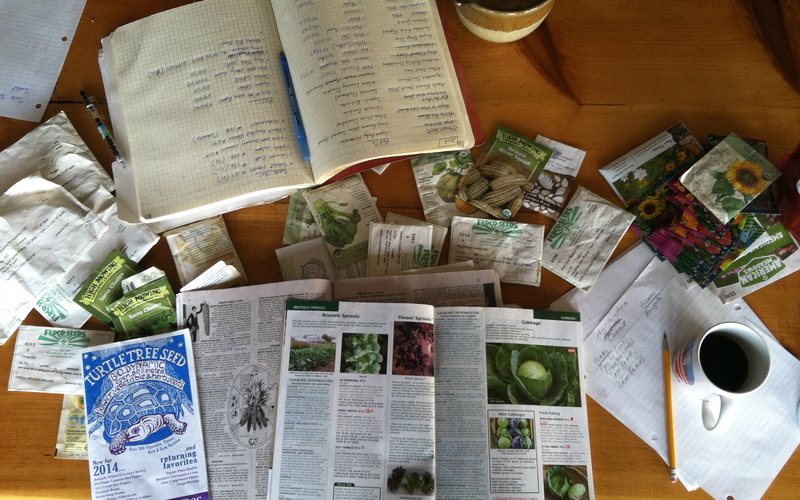 So, we unearthed the seed catalogs from their increasingly hidden spot Under Other Stuff and grabbed a notepad and the Farm Book and got to work. The Farm Book is very much like a middle child’s Baby Book. We started it with the intention of recording everything we planted and grew and raised. It started off with thoroughness and exuberance–both of which quickly petered out. 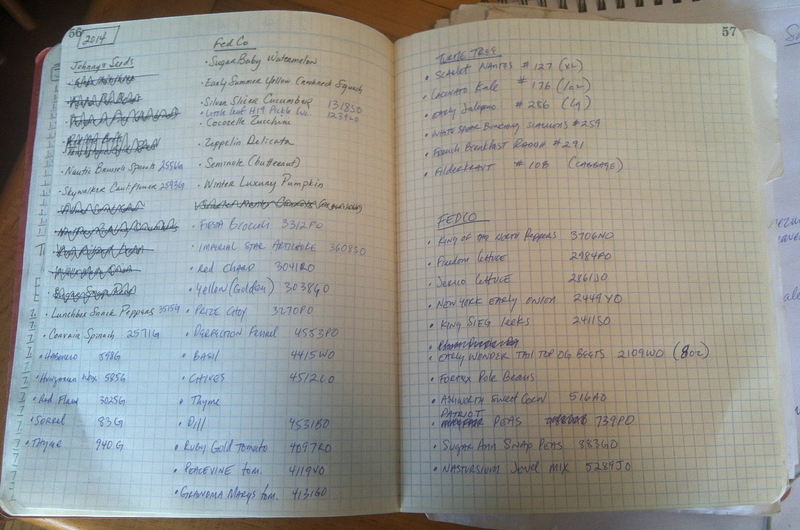 We do still maintain the Book in our own randomly organized way, however. 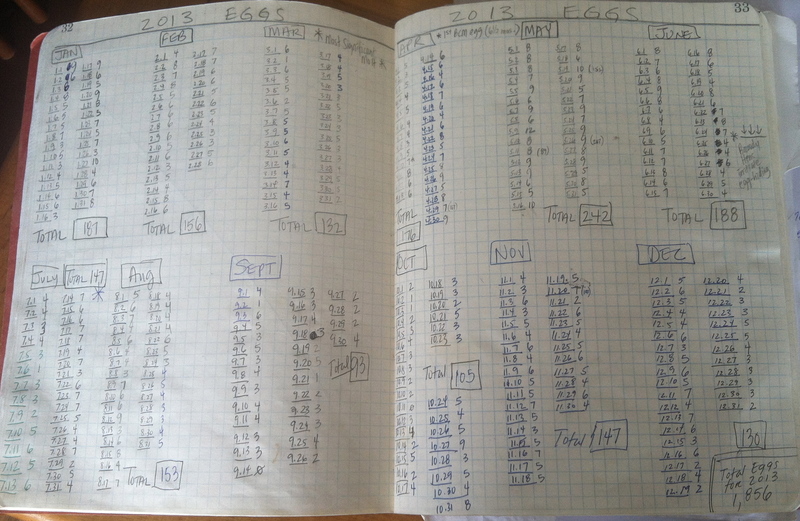 We’ve recorded every single egg that’s been laid on the farm, mapped out gardens, and monitored the weights and eating habits of some of the pigs. A great many things have been left out, of course. As with any middle child, the documentation lost its thunder after the first year and now it is more of a place for the occasional note, thought, list, or doodle. The start of this year’s garden plan. Having done this only twice before, we are still VERY novice and our direction for farming is only just starting to take shape. We have two years of successes and failures under our belt and there is great joy in feeling like we know certain varietals that will work and others that won’t. There is trepidation in trying something new. There is nervous anticipation in trying something again that failed before. Who knew farming could be so emotionally taxing? Well, probably loads of people, actually. The front garden, not ready for planting. 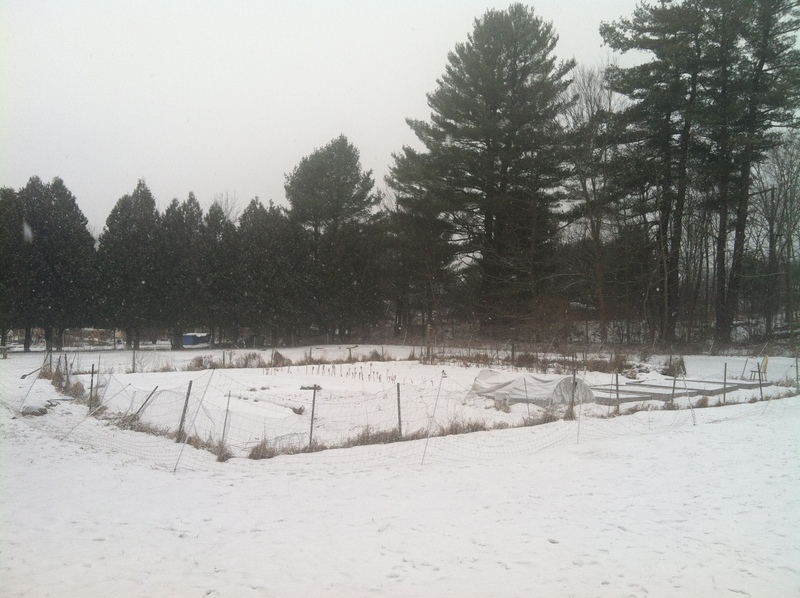 Mercifully, before things got out of hand and I ran irrepressibly out to the garden with a bag of seeds and a shovel, the temperatures dropped and the snow came back. Today, the front and back gardens are again covered in snow. The patches of grass are no longer visible and the puddles have turned back into frozen patches. My enthusiasm for planting is successfully, and thoroughly, squashed. This entry was posted in Uncategorized and tagged applewood farm, Baby Book, farm book, garden, middle child, organic farming, organic garden, planning, planting, seed catalogs, seeds, snow, warming weather. Bookmark the permalink. I keep a journal for my garden but I find myself writing on small pieces of paper and gluing the notes in the journal instead of writing IN it. LOL Don’t worry, Spring is just around the corner. That’s too funny! I almost included a shot of the seed list we wrote on a separate piece of lined paper and then stuffed into the front of the Farm Book. Ah well, hopefully we’re better at farming than record keeping, huh? We usually have a false spring and everybody gets gung ho to start planting. Then the winter and snows come again (sigh). You never fail to make me smile, and usually chuckle. Almost, (I said almost) makes me want to go out and dig up the ground behind my condo and plant, uh? stuff. But since It hasn’t gotten over 10 degrees since Oct., I think that’wishful thinking. Besides that, I love living here and I don’t think that would endear me to the few (very) few residents who don’t know what to make of me.